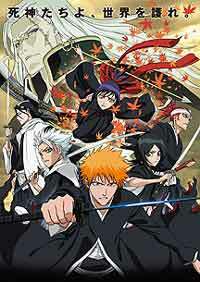 Also Recommended: Bleach, Ninja Scroll, HunterxHunter, Urusei Yatsura: Only You, InuYasha: Affections Touching Across Time. While doing a regular clean-up of Hollows, Ichigo and Rukia meet a rouge Shinigami named Shenna. Shenna is being threatened by a supernatural group of terrorists called The Dark Ones, and Ichigo becomes emotionally involved in rescuing yet another damsel in distress. I'll be straight with you, Dear Reader. I went into Bleach: Memories of Nobody expecting it to fail. This was probably because I had a conversation with another fan just yesterday about the show, and he pointed out several weaknesses I never saw or considered in my original review. And these weren't small, nitpicky things either, but gaping weaknesses that can kill the show's suspense and entertainment value. It felt funny, watching so many holes get shot into one of my favorite shows. These were things I thought I should have seen myself, but had somehow either ignored or missed. "Maybe," I thought, "maybe it's nowhere near as good as I thought it was." And whether that holds true for the series, I won't know until the inevitable rewrite as I've started buying DVDs by the season. But as for the movie itself, I am happy to report that this fan was pleased with how Memories of Nobody turned out. It was pleasant surprise. In the tradition of other Studio Peirrot movies like Urusei Yatsura: Only You and InuYasha: Affections Touching Time, this movie was made simply to please fans, and it makes that goal with professional ease. After an incoherent opening sequence that was supposed to pique curiosity, but only inspired only confusion, we find ourselves in a familiar situation. A young nameless, anonymous plot device- er, I mean spirit girl- is running from a Hollow. And chasing that Hollow is Ichigo and Rukia, on what I assume is a breezy autumn Saturday because it looks they have nothing much better to do than, you know, save the world. Kids these days. 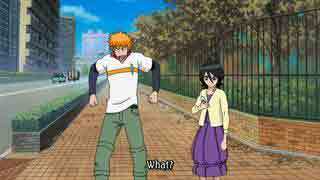 And Rukia, that skirt makes you look fat. Her name is Shenna. She is a rogue Soul Reaper with no memory of what unit she is in or when she came to Earth. She likes ribbons in her hair, riding Ferris Wheels, and teasing Ichigo as the movie moves along. For me, she is the reason this movie worked as well as it did. She is a sweet character who is likeable from pretty much frame one, and nothing is done to change that. The Dark Ones, the prerequisite villains of the movie, have taken an interest in her and those ghost things you see surrounding her in the above picture. It soon becomes paramount to the survival of both the Real World and the Soul Society that she be protected. Ichigo is naturally the man for the job, but to do it he must slice through both The Dark Ones and Soul Society red tape. There are notable weaknesses of this movie, mostly having to do with not making any sense or having only the vaguest sense of reality. Writing them up individually, though, feels nitpicky, and I get the sense that people who really want their movies to make sense probably wouldn't be watching anything like Bleach. I doubt they'd be watching much anime, either. The animation for the movie is up to par with the normal standards of a feature-length movie. It's probably nothing to write home about, but there were a couple of scenes that dazzled my eyes, especially after watching the more washed out Ajumi ~Beach Story~. The plot moves along steadily without feeling too forced or artificial. And while most of the characters from the series make an appearance, this is not a reunion movie. Orihime, Chad and the rest of Ichigo's posse fade to the background and only make cameos. This was a wise move, since there's only room for so much in the movie. Ichigo and Shenna are the focus here, and nothing is done to stray from that. The music gets its own paragraph. Props to the music director, or whatever the job is called, for the score in this one. While it's not worth buying a soundtrack for, it does an excellent job of complimenting the movie without melodrama. While there is yet another remix of "Number One" in the opening using guitar riffs that sound suspiciously like Michael Jackson's "Beat It," the rest of the music is very eclectic, using screeching violins during one fight scene, moody opera while visiting a carnival of souls, and a haunting MIDI sequence when things get really bad for our heroes. It takes skill to make a soundtrack that compliments the action as well as the one found here. "Fans shouldn't be disappointed by Bleach: Memories of Nobody, but here being a fan is like the dress code at a fancy restaurant. If you don't meet the dress code, no steak for you." Recommended Audience: Stylized violence and mild language, but nothing that should scar all but the very young for life. In other words, typical Shounen fare.